There are tons of places to get tacos around the italian market. 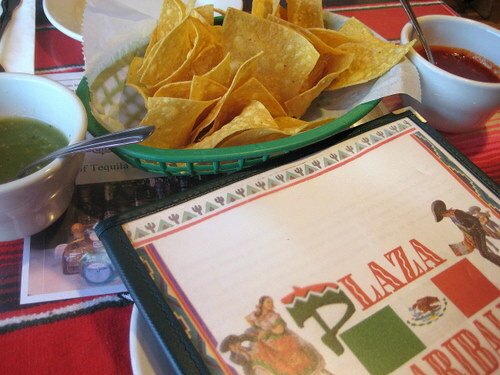 We stopped by Plaza Garibaldi per S’s recommendation. When we walked in, it was mostly filled with mexicans, which is always a good sign. The place is colorful and apparently, they have a liquor license now. After an extremely awkward exchange, where our server clearly didn’t understand that I wanted a limon jarritos, I ended up going over to the cooler and just getting my own soda. I guess I am that terrible at uttering “jarritos, limon”. Sadness. The complimentary chips and salsas were just dandy. 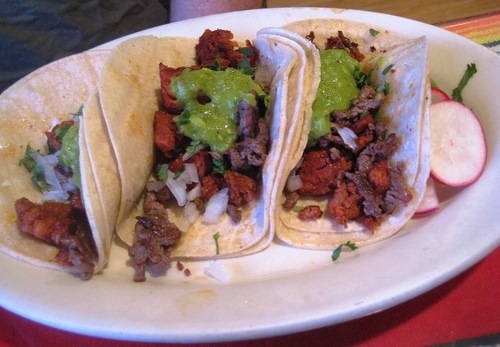 Here are the Campechanos tacos, which are steak and mexican sausage. All of the tacos here are served with raw chopped onion, cilantro, and guacamole as toppings. This is the first place where I’ve gotten guacamole as a default taco topping. I didn’t mind it a bit! You also get lime and radish slices on your plate. I love radishes! So these tacos were damn good. Both the steak and the sausage were full of flavor and I loved all the toppings. 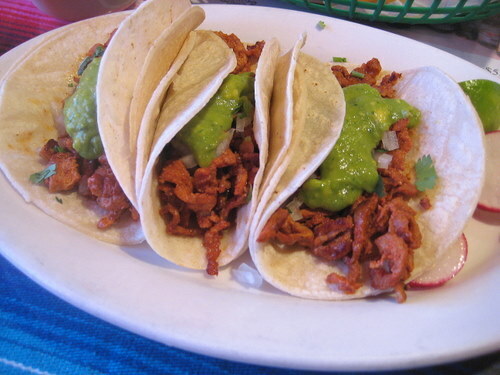 I got the Al Pastor tacos and these were only so so. I mean they were fine, but the campechanos just had so much more flavor. And honestly, where were the pineapple? I didn’t see any, let alone taste any. Next time, I’ll just go for the campechcanos!